In this newest offering from Wiggs, a woman’s life shatters and she finds the glue to piece it back together through diving into her past. She has to go from the coast of California to the fields of France to figure out what is really happening and how to find freedom, but along the way she finds contentment, peace, and even a happily ever after. I have been a fan of Susan Wiggs for nigh on a decade. Her way of fleshing out characters with ordinary problems and very normal issues feels achingly authentic. As she’s veered away from traditional romance (focus on two people exclusively) to more general women-centric fiction (focus on multiple, but connected women throughout the story, romance present but not central), I’ve appreciated her even more. This heroine hit me wrong a few times (her fear-driven life was stressful and her fat shaming of her daughter even more so), but we all have our flaws and in the end I was pleased with her growth. This story took a deft hand to craft. Wiggs juggles mystery and a few time jumps, as well as adolescent angst and mother/daughter relationships. As a frequent reader of this genre, Wiggs is one of the best. 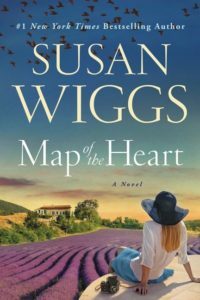 If you’re looking for an engrossing read, complete with a historical mystery, and a trip to France, then Map of Your Heart is your winner. Clearly, if you’re heading to France, a good red wine is you best bet, so that’s what I’d recommend here. This ICYMI Review originally appeared at Fresh Fiction. Susan Wiggs’ Page: If you’ve never read her before, the Chicago Fire trilogy is my personal favorite, by the way. Not all the rendezvous between French women and American soldiers were consensual during the liberation of France, by the way. A little bit more history of wine and France during WWII.